KINGMAX M.2 2280 PCIe NVMe Gen3x4 SSD PX3480 features incredibly high sequential read/write speeds of up to 3,400/3,000 MB/s, where its read speed is 6 times faster than SATA III SSDs. Furthermore, it applies the intelligent SLC Caching and DRAM Cache buffer technology to further accelerate transferring speeds and system response time. No more long waits for application loading and data transferring, the M.2 PCIe SSD PX3480 is perfect for gaming, media editing and multitasking. In addition to its stunning R/W performance, the Zeus PCIe NVMe SSD is designed with a tiny M.2 2280 form factor that lets you store up to 1TB of your important files without occupying much space of your thinnest notebooks, mobile applications, and PC desktops alike. 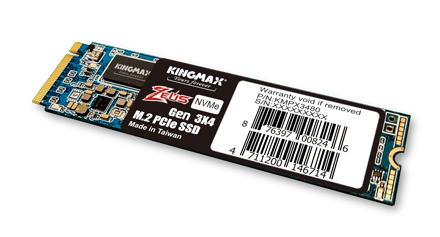 KINGMAX Zeus M.2 2280 PCIe NVMe Gen3x4 SSD PX3480 supports LDPC (low density parity check) ECC (error correction code) technology to effectively detect and correct R/W errors for higher data accuracy and a longer lifespan. It also supports TRIM command, wear leveling and garbage collection to guarantee higher durability by decreasing data amplification and wear of the flash cell. The M.2 PCIe SSD PX3480 enables NCQ command, which can improve a SSD’s performance by optimizing its read/write executions. The S.M.A.R.T. monitoring system is also applied to prevent data loss for it can perform early detection of potential future failures. 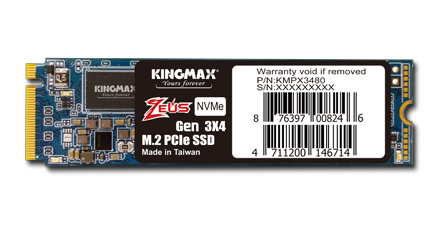 KINGMAX M.2 PCIe SSD PX3480 is 100% factory-tested to promise high stability, durability, and compatibility. It is backed by a 3-year warranty for complete after-sale services. Combined with an affordable price and superior performance, the M.2 PCIe SSDs become the best storage upgrade for both budget- or performance-oriented users. For more information, please visit Here.